Stomata are epidermal pores that enable controlled gas exchange across the leaf’s surface while restricting water loss and are thus crucial for a plant’s survival. In Arabidopsis, they are formed by a distinctive set of cell divisions and cell state transitions. Protodermal cells enter the stomatal cell lineage through an asymmetric entry division that gives rise to a smaller cell, the meristemoid, and a larger stomatal lineage ground cell (SLGC). The meristemoid has limited self-renewing capability, it can undergo further asymmetric amplifying divisions and thereby produce additional SLGCs. Eventually, the meristemoid then differentiates into a guard mother cell (GMC), which divides once symmetrically to give rise to the two guard cells (GCs) that form a stoma (Fig. 1). The surrounding SLGCs can either differentiate into pavement cells – the puzzle-shaped basic cell type of the epidermis – or can themselves undergo another asymmetric division, giving rise to a satellite meristemoid. This division is referred to as a spacing division as the new meristemoid is formed away from the existing meristemoid/stoma, ensuring that two stomata are always separated by at least one non-stomatal cell (“one cell spacing rule”). Figure 1: Schematic representation of stomatal development. SPCH controls asymmetric divisions producing meristemoids (M) and stomatal lineage ground cells, MUTE promotes guard mother cell (GMC) identity and the GMC’s symmetric division, while FAMA prevents additional guard cell (GC) divisions (reproduced from Simmons, Davies et al., Fig. 1 A, under a CC-BY-NC-ND 4.0 license). Cell divisions and cell state transitions in the stomatal lineage are controlled by the sequential action of three closely related bHLH transcription factors1, 2: SPEECHLESS (SPCH) promotes entry, amplifying and spacing divisions; MUTE represses meristemoid identity in the GMC and triggers its symmetric division to form GCs; eventually, FAMA prevents further division of the GCs and locks them in a differentiated state. How these processes are controlled downstream of these transcription factors has only begun to be understood. In their preprint, Simmons, Davies et al. 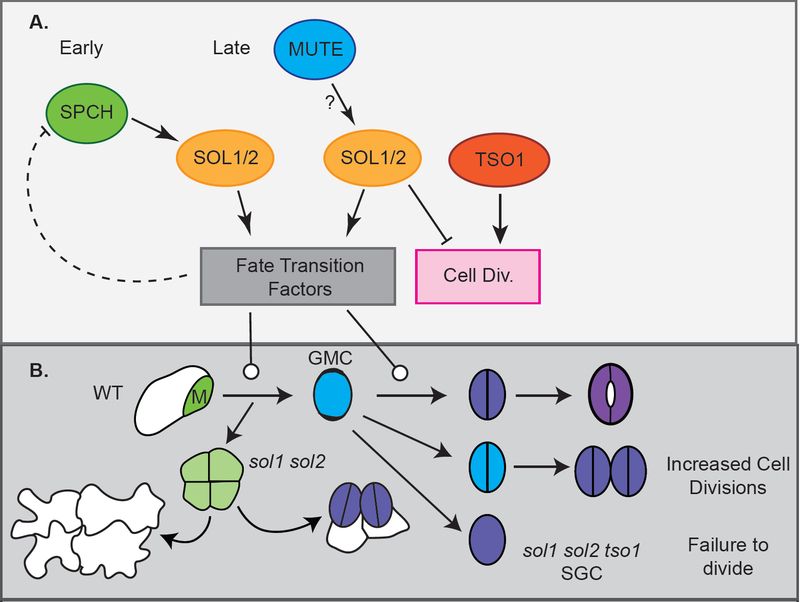 report the cysteine-rich repeat (CXC)-hinge-CXC (CHC) proteins TSO-LIKE1 (SOL1) and SOL2 as novel SPCH targets, whose function is required for several cell state transitions throughout the stomatal lineage. Genes directly bound and upregulated by SPCH had been identified in a previous study by the Bergmann lab3. Two of these direct targets – SOL1 and SOL2 – are homologues of animal DNA-binding components of DREAM complexes, protein complexes involved in cell cycle regulation and cell differentiation4. As the SOLs’ function in Arabidopsis was unknown, the authors investigated a potential function of SOL1 and SOL2 in stomatal development. Expression of SOL transcriptional and translational reporters was detected in meristemoids and GMCs, following the expression of SPCH-CFP and MUTE-CFP reporters, respectively. Time lapse imaging further pinned down the precise timing of SOL protein accumulation – their signals disappeared just before the division of the meristemoid or GMC, suggesting that their accumulation is tightly linked to the cell cycle. To further understand SOL function, the authors went on to characterise T-DNA insertion mutants. While single sol1 and sol2 mutants showed no apparent defect in epidermal patterning, a sol1 sol2 double mutant displayed an increased number of small meristemoid-like cells occurring in clusters in a young leaf’s epidermis and pairs of stomata in direct contact in the epidermis of mature leaves. Time lapse imaging revealed that these pairs can form in two different ways: (1) Two meristemoids in a cluster of four may differentiate into GMCs, with the subsequent symmetrical divisions giving rise to two stomata in contact; (2) GCs may divide symmetrically a second time to form four GCs. Thus, SOLs appear to have multiple roles: as downstream targets of SPCH they promote the transition of meristemoids into GMCs, but they are also required at the following stage (possibly downstream of MUTE), restricting the GMC to a single symmetric division (Fig. 2). Figure 2: Model of SOL function in stomatal development: (A) SPCH induces expression of SOL1 and SOL2, promoting the meristemoid (M) to GMC transition. In GMCs, SOLs may act downstream of MUTE to regulate the GMC to GC transition and restrict cell division, in opposition to TSO1. (B) The sol1 sol2 mutant exhibits increased cell divisions at both the meristemoid and the guard cell stage. Lack of TSO1 function in the sol1 sol2 background partially reverses this effect, resulting in GMCs that fail to divide (reproduced from Simmons, Davies et al., Fig. 7 A and B, under a CC-BY-NC-ND 4.0 license). The closest paralogue of SOL1 and SOL2, TSO1, also turned out to be involved in stomatal development. Whereas tso1 single mutants did not display altered epidermal patterning, knock-down of TSO1 in the sol1 sol2 background led to the formation of single guard cells (SGCs) that failed to divide, a phenotype also generated by SOL2 overexpression. Thus, TSO1 appears to act partially in opposition to SOL1 and SOL2, promoting the final GMC division. How patterns emerge during tissue and organ formation is a fundamental question in developmental biology. The present study does a remarkable job at shining more light onto one of these processes: it identifies novel regulators of stomatal patterning downstream of known master regulators, gives us an idea about their function in early and late stages of the process and opens up several lines of research that can be followed from here on. There are eight CHC proteins in Arabidopsis, five of them uncharacterised – do they they have a role in stomatal development as well? Animal CHC proteins are part of DREAM multiprotein complexes – is this also the case for the SOLs in plants? SOLs may function as repressors of the cell cycle – which targets do they control to achieve this function? Lack of SOLs slows the transition from meristemoid to GMC, but does not prevent it completely. Which proteins contribute to this transition alongside the SOLs? Han, SK, and Torii, KU (2016). Lineage-specific stem cells, signals and asymmetries during stomatal development. Development 143(8): 1259-70. Lau, OS, Davies, KA, Chang, J, Adrian, J, Rowe, MH, Ballenger, CE, Bergmann, DC (2014). Direct roles of SPEECHLESS in the specification of stomatal self-renewing cells. Science 345(6204): 1605-1609.